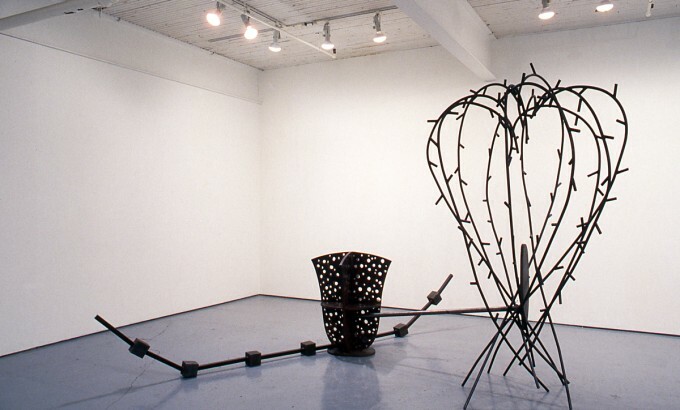 Opening Thursday March 15 at 8:00 pm and continuing through to April 14, Mercer Union presents a major solo exhibition of works by Toronto sculptor John McKinnon. 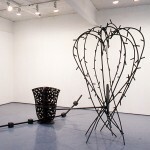 This exhibition, in both gallery spaces, offers Toronto audiences an opportunity to view an extensive selection of the artist’ s new sculptures in conjunction with a number of previous works. 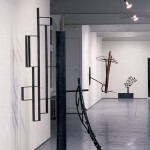 Working with standard issue mild stock steel, bar, plate and tube, McKinnon creates works that resist the massiveness often associated with these materials. Instead, his works are characterized by a ‘structural/skeletal’ quality, retaining the leanness and linear quality of a sketch. 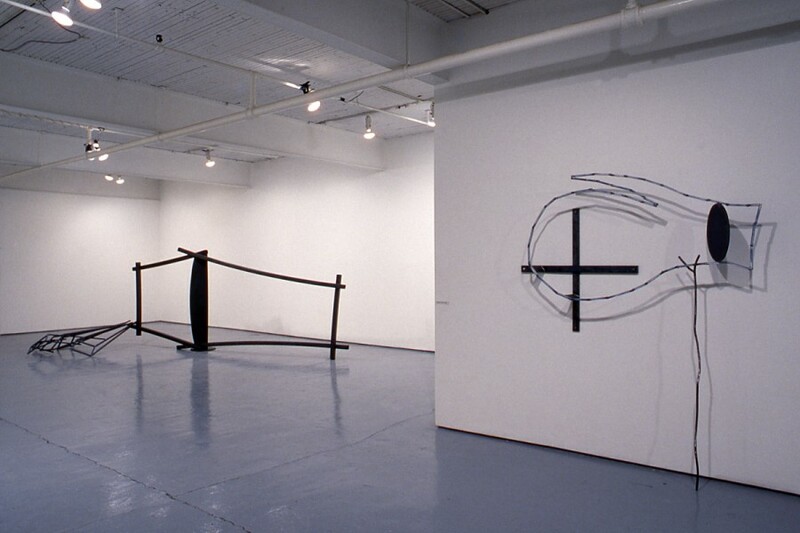 McKinnon strives to present the viewer with a belief system. He employs a visual narrative, often culminating in an event, a moment or an affective state, within the structure of the narrative, pointing to a larger subsequent history. Through his cryptographic notations, he gives concrete form to abstract representations, moving freely back and forth between ontological, physical and cosmological dimensions. 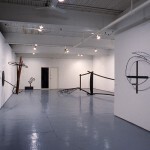 A Toronto based artist, John McKinnon has participated in solo and group exhibitions in Toronto, Burlington, Oakville, Stratford, Ontario, Montreal, Edmonton and New York since 1976. 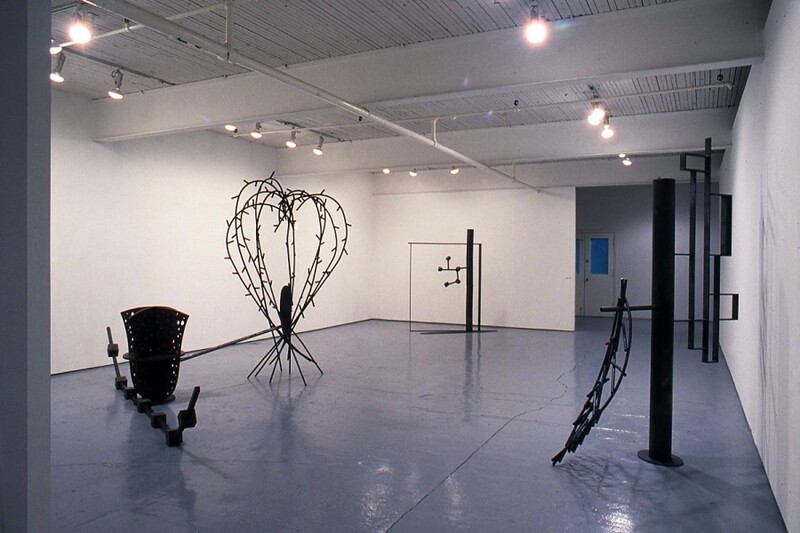 McKinnon has worked on several local public art commissions, including a permanent installation, in collaboration with Brian Kipping, for Toronto’s City Hall in 1987. He has most recently been involved in the design and production of a 1400′ fence for Copperfield, a new housing complex in Toronto’s West End. The exhibition will be accompanied by a catalogue which will include essays by Toronto writer and curator Ihor Holubizky and Toronto artist Bernie Miller. 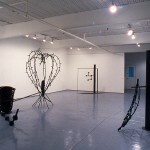 Sculptors as object makers, through their choice of technical means or formal options, position themselves in relation to the industrial process of object making, whether consciously or otherwise. Modern industrial society has brought about a very basic transformation in the nature of work. As long as the apprentice-craftsman system had endured, earning a living comprised of both productive activity and the social relations of commerce. Goods were made for and sold to individuals and the relationship between craftsman and individual purchasers essentially affected the definition of work. In a highly mechanized machine production, however, where both commercial interchange and interchange of long-term training had been largely excised from the work routine of labouring classes, the exchange between people both in the learning process of apprenticeship and with the customer became separated. The world of things and the world of people were cleaved from each other in the industrial process. This basic separation was repeated in the separation of the planning and the organizing of work from the actual execution. Thinking and doing were separated in the workplace. The process of Taylorization, scientific management, etc., assured that “the one who did the work could not derive or fully understand its science. . .those who understood were to plan the work and set out the procedure.”2 Coincident with this actual separation in the workplace was its reinforcement in matters cultural. Advertising and, by extension, product design, and, by further extension, the entire industry of mass culture now sustains this separation of people and things by referring as little as possible to the source of things, that being in the modern factory. A conception of products which denies not only the reality of the human participation in production, but also the ability of human understanding to comprehend their mystified nature within such a world, the product takes on a mysterious reality, impervious to the understanding or action of the population… It is as if one progressed from a world where elements are welded to a world where they are juxtaposed and held together by sole virtue of their wondrous shape; this is meant to prepare one for the idea of a more benign nature; benign, partly because the element of human tension has been excised from it. There are a range of technical methods and formal choices involving the commodity which establishes a sculptor’s relation to it, politically speaking. 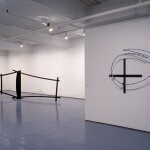 This range includes the direct, whole integration of the commodity as in collage and assemblage techniques, as well as the destruction and redistribution of fragments in new combinations, recombinations, akin to bricolage and recontextualizations. But there is also a choice of method that excludes the commodity altogether and uses products made available from primary industry sources. In choosing materials and techniques from the pre-commodity stage of the industrial process one invokes a pre-commodity era as well. The organization of work in these particular industries or times, if you will, is, or was, not particularly unoppressive either. If one chooses the products of primary industry over the incorporation of commodities into an art work it seems as if one jumps from one frying pan into another, just as surely as one form of industrial oppression replaces another. The fact remains that advertising and design are not commonly associated with these materials; they are, in effect, ideologically non-existent. Assuming that an object maker is critical of conditions under which his or her materials are made available, there are then contradictions in the use of the products of manufacturing. If one is critical of the commodity and the relations it presumes, then there is a degree of irony associated with its use in its own critique as in, for instance, a strategy of appropriation. This was the historical circumstance in which culture as we now know it, including mass culture, was formed. So the view of traditional practices whether intended or not was seen, historically, by the creators of our mass culture as pockets of resistance. Given this then, I would suggest that all art practices have this potential for resistance to the commodity nexus, if commodity is here understood as that made object which stands in a peculiar ideological relation to its origins in human endeavour. 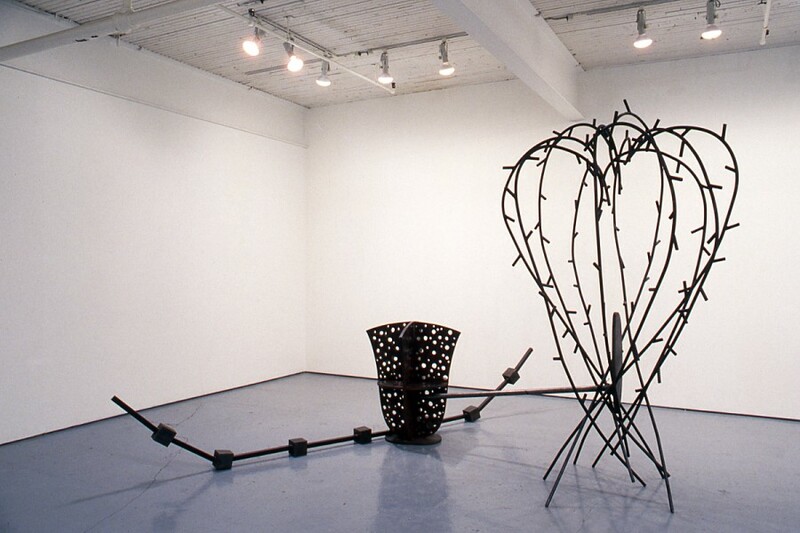 John McKinnon’s long-time use of welded steel is party to a dilemma whether consciously or not. To walk into a studio where an artist does his own welding is to walk into a workplace where the work is organized as if Henry Ford had never lived. In such a studio the air is thick with connotations of the artisan, the atelier, the craftsman-apprentice system; one thinks of metallurgy, vulcanism, the basic elements. Scientific management? Hah! True, there are escapist seductions to such practices. But just as there is a denial of the outside corporate world here, there is something in these made objects that the corporate commodity has gone to great effort to deny–their source in human effort. McKinnon’s sculpture is very clearly worked, one might say to some extent it appears wrought. The plasticity of the steel is in high evidence. Elements are often bent, marked up and flame carved before they are welded together in an articulate readable ensemble. His insistence on treating steel as a medium in which to draw, rather than treating it as the materials of massive support structures, emphasizes this wrought character. Somehow one is not burdened by a labour that is intensive, nor is the character of the work heroic as in a struggle with inert mass. It seems often, quite the opposite: skeletal, even alien, often vulnerable. This very ‘made’ character of the work in a direct way counters those aspects which are ideologically suspended in the commodity form. Is it not possible then, that this relation to work, the body, the senses be seen as an equally suitable site of resistance to the corporate organization of human endeavour? Equal, that is, to the more obvious forms of critique. 1. Stuart Ewen, Captains of Consciousness ~New York: MacGraw Hill Book Company, 19761, p. 55-56. All quotes in this essay are taken from this text. 2. Ibid, p. 106. Ewen quotes Samuel Haber from Efficiency and Uplift, as quoted in “The Origins of Job Structure in the Steel Industry” by Kathy Stone, Radical America, vol.7, no.6 “Nov-Dec 1973”. 3. Ibid, p. 105. Ewen quotes from Mythologies by Roland Barthes, 1972. Bernie Miller is a Toronto based artist. 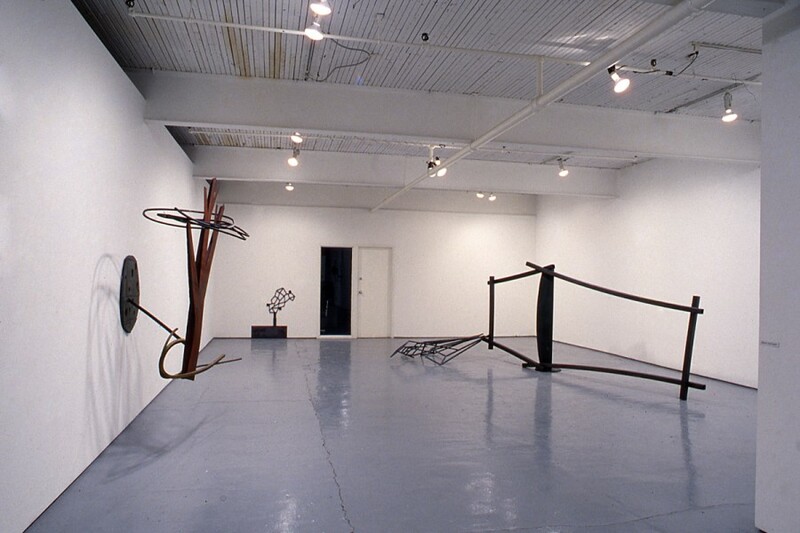 John McKinnon’s recent exhibition at Mercer Union (March 15-April 14) was a mini retrospective of sculptures produced since l986. McKinnon, avoiding philosophizing and emotive expressionism, presented sculpture that is unapologetically concerned with pure form. Potential narratives and symbolic images are inferred but ultimately it is the visual impact of sculpture that is the essence of his art. What is most striking about McKinnon’s sculpture is the dense, linear configurations of steel rods and bars that characterize his work. 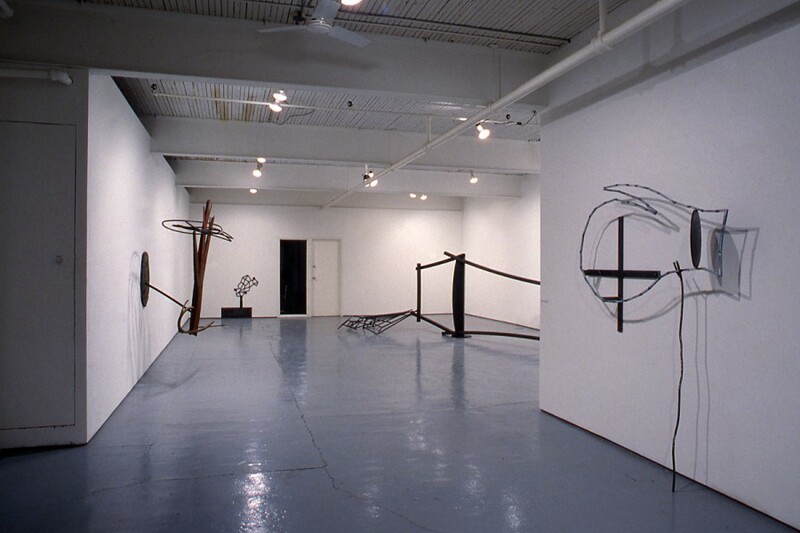 Despite the thinness of the steel the sculptures are fluid; like quick, spontaneous line drawings. Roughly hewn and unfinished in appearance, they are wrought, paradoxically, into delicate, elegant forms. McKinnon is fascinated by the basic, pared down structure of objects. 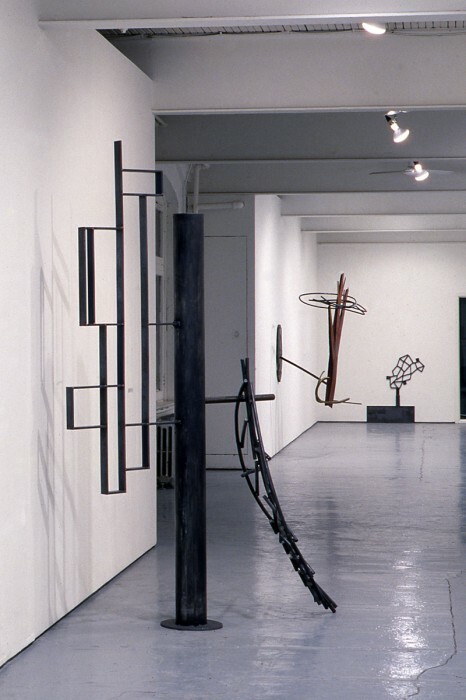 Take, for instance, ‘postures before a shadow’ (1989), where he has divided, by means of a vertical steel rod, a skeletal outline of a leaf and a rigid geometric grid that is distinctively architectonic in nature. These imaginative forms, however, do not provide commentary on the subjects they depict. The piece instead functions as an all encompassing image that is completely captivating in itself. Outstanding in the exhibition is ‘Plan of a coal mine’ 1990, a piece whose strength lies in its vibrant variety of visual contradiction. An airy rectangular structure, constructed of sharp, lean, vertical lines is contrasted with the bulkiness of squarish, geological forms, apparently coal. The piece carries a number of allusions to nature, the elements and the earth, but McKinnon does not provide any definitive narrative, leaving the interpretation of the piece to the imagination of the viewer. 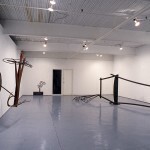 There is something about these sculptures, their unruly ruggedness perhaps, that makes them appear out of place when installed within the white walls of an art gallery. It would seem much more fitting to display them outdoors, like the several public sculpture commissions McKinnon has already been awarded. He has received two particularly prestigious commissions: one for the completion of a decorative fence for Copperfield, a new housing complex in North Toronto, the other for an installation produced in collaboration with Brian Kipping, for the entrance to the councilor’s office in City Hall. McKinnon, certainly an eclectic artist, has also ventured into the territory of design, producing one-of-a-kind furniture which shares the graceful form of his sculpture. John McKinnon simplifies sculpture to a state where the pure beauty of fundamental form is given preference over possible meaning. But it is more than worthwhile to explore the complexity that McKinnon has discovered lying within the structure of things.